The Laser Center, a department of Fort Sanders Regional Medical Center, occupies the fourth floor of the Thompson Cancer Survival Center where all clinical procedures are performed. The Laser Center is a state-of-the-art outpatient facility fully equipped to provide a full array of treatment options for Barrett’s patients, such as Radiofrequency Ablation (BÂRRX), Endoscopic Mucosal Resection (EMR), Cryoblation, Laser ablation as well as Bravo pH monitoring for patients with Gastroesophageal Reflux Disease (GERD). All procedures are performed under moderate sedation using propofol provided by the anesthesia department. The facility consists of the treatment area, recovery area, waiting room, registration area, patient education room, exam rooms, and administrative area. The Laser Center is staffed by laser treatment specialists, physicians, nurses, research staff, and administrative staff. Fort Sanders Regional Medical Center is a 556-bed hospital serving Knoxville and surrounding counties and is located across the street from the Thompson Cancer Survival Center. TCSC and the Medical Center provide laboratory, pathology, radiology, cardiology, and oncology services. FSRMC is used if a need for inpatient services arises. Gastrointestinal Associates (GIA)/The Endoscopy Center consists of thirteen gastroenterologists, a several practitioners, nurses and staff. The Endoscopy Center is a licensed ambulatory surgery center (ACS) associated with GIA where endoscopy procedures are performed. It holds the distinction of being the first certified freestanding endoscopic ASC in the nation. The group has been involved in clinical and preclinical activities photodynamic therapy for esophageal cancer and dysplasia in Barrett’s esophagus since 1989. Innovative Pathology Services, located within a block of Thompson Cancer Survival Center, provides histological evaluation of all biopsies performed at the Laser Center. The group consists of 15 board certified pathologists who provide next day turn around on final pathology reports. All samples are evaluated by two expert pathologists. Such prompt turn-around time allows the evaluation of patient response to treatments rapidly, offering additional treatments if necessary within 24 hour of biopsies. Anesthesia Alliance of East Tennessee, located across the street from Thompson Cancer Survival Center, provides Monitored Anesthesia Care (MAC) for all endoscopy procedures performed at the Laser Center. The group consists of 17 board certified anesthesiologists and over 50 Certified Registered Nurse Anesthetists (CRNA). The Group has been providing anesthesia services for the Laser Center patients for several years. 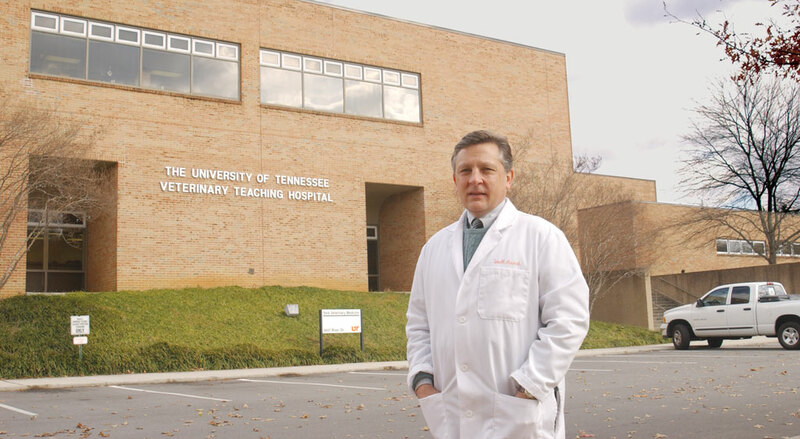 Clinical Trials Department provides state-of-the-art clinical research for physicians and patients in the East Tennessee area. The staff includes a team of highly qualified oncology certified nurses who coordinate and perform data management for oncology protocols in cooperation with NCI research groups such as the Southwest Oncology Group, the National Surgical Adjuvant Breast and Bowel Program, and the Clinical Trials Support Unit. In addition, research is conducted in collaboration with several pharmaceutical sponsors and other cancer research centers. Clinical Trials department has been involved with Barrett’s research since 1989. The department is located on the 7th floor of the Thompson Cancer Survival Center. College of Veterinary Medicine, University of Tennessee (UTCVM) The Laboratory at the College of Veterinary Medicine at the University of Tennessee has been the site of pre-clinical research. The laboratory has been used for research and development of new techniques and devices as well as for hands-on training during our PDT courses. The Laboratory is equipped with lasers and endoscopy systems similar to those used in our clinical areas. This laboratory was critical in testing and developing the balloon for PDT of Barrett’s esophagus. The small animal clinic within UTCVM is the referral center for East Tennessee where client owned animals have access to the latest in diagnostic and therapeutic modalities. Advanced Biomedical Science and Technology Group, Oak Ridge National Laboratory (ORNL)The Advanced Biomedical Science and Technology Group is a biomedical research division located at Oak Ridge National Laboratory, about 20 miles from the clinical facilities of the Center of Excellence. The group at ORNL conducted extensive research in collaboration with Laser Center on non-invasive optical techniques for detection of dysplasia and early cancer in Barrett’s esophagus and skin cancer. The Medical/Nursing Research Library is located on the third floor of the Thompson Cancer Survival Center. It currently houses more than 5,000 books and subscribes to 175 clinical journals. The library is staffed with two librarians, who are available to provide immediate access to medical journals and up to the moment medical literature through library online databases. The library conducts monthly searches of databases for all relevant published papers. The Fellowship Center is an outpatient lodging center created to assist out of town patients and family members with housing while the patients receive care at the Thompson Cancer Survival Center or the Fort Sanders Regional Medical Center. The Fellowship Center consists of eighteen fully furnished apartments with laundry facilities. The apartments are provided free of charge to all patients. The services are totally sustained through the generosity of its guests and friends. The Fellowship Center is a member of the National Association of Hospital Hospitality Houses. The Fellowship Center is located within a block of the Laser Center. The Thompson Cancer Survival Center Foundation, established in 1994, extends resources to such projects as therapeutic and diagnostic research, education, and direct patient care. The Foundation has been instrumental in the establishment of the Barrett’s treatment program and continues its support through annual grant applications.